Lilva Kachori is a perfect snack for a party. Lilva Kachori is healthy, protein booster, nutritious and tasty at the same time. I made backed Lilva Kachori rather than deep fried, which is healthier than deep fried. Lilva Kachori is perfect for celebrations or any occasions like Diwali, Holi or Eid festival to celebrate healthier way. The one black spot that usually mars the goodness of kachoris is that they are deep-fried. Here is a non-fried version of Lilva Kachori that you’re sure to enjoy as much as the original. You can now indulge in the protein boost of Lilva and green peas without worrying about the calories of a deep-fried snack! Lilva Kachori is a traditional kachori made with a stuffing of fresh or frozen tuvar and green peas perked up with ginger and green chilies. A dash of lemon adds to the chatpata taste of the stuffing, making this an exciting snack to bite into any seasons like winter, cloudy or rainy days. The flaky and crisp kachori with an excitingly spicy stuffing, is a must-try recipe. 1. In a mixing bowl, add flour, suji, besan, salt and melted ghee. Rub the mixture with hand palms and mix it well. 2. Add water little by little, knead it and make a stiff but smooth dough, do not knead the dough too much. 3. Make the small lemon size balls from the dough and cover it with damp cloth and keep aside. 4. 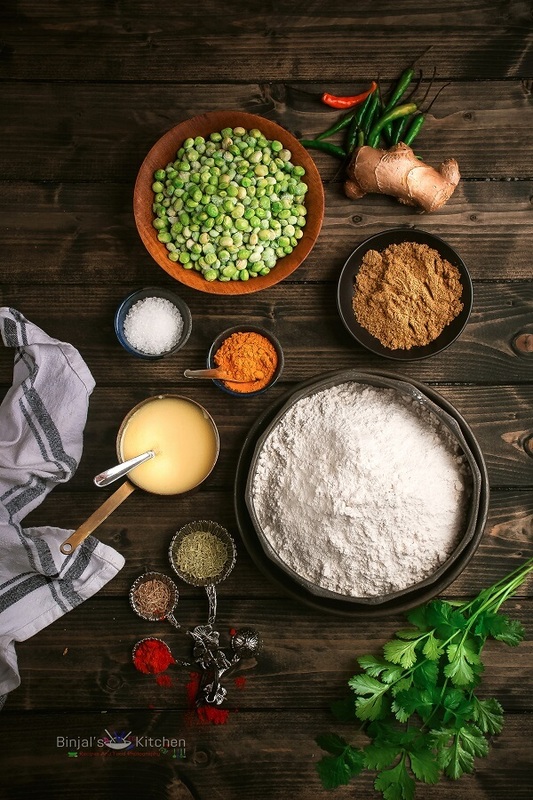 In a food processor jar, add pigeon peas, green peas, coconut, ginger, green chilies, coriander leaves, salt, sugar and lemon juice. Blend it and make a coarse mixture. 5. Heat the oil in a kadhai. Add cumin seeds, hing, the prepared coarse mixture, red chili powder, turmeric, coriander powder and stir fry it for 1-2 mins. 6. Remove it from the flame and keep aside to cool down. 7. Preheat an oven on 350F/180C. 8. Take the prepared dough ball and roll it into small circle. Use a drop of oil if its sticking while rolling. 9. Put the spoon full of the prepared stuffing on center of the circle. 10. Seal the edges on top, remove the excess dough, give a round shape by rolling between the palm and make a perfect round ball to make a round kachori. 11. Repeat the same method and make more round kachoris. 12. 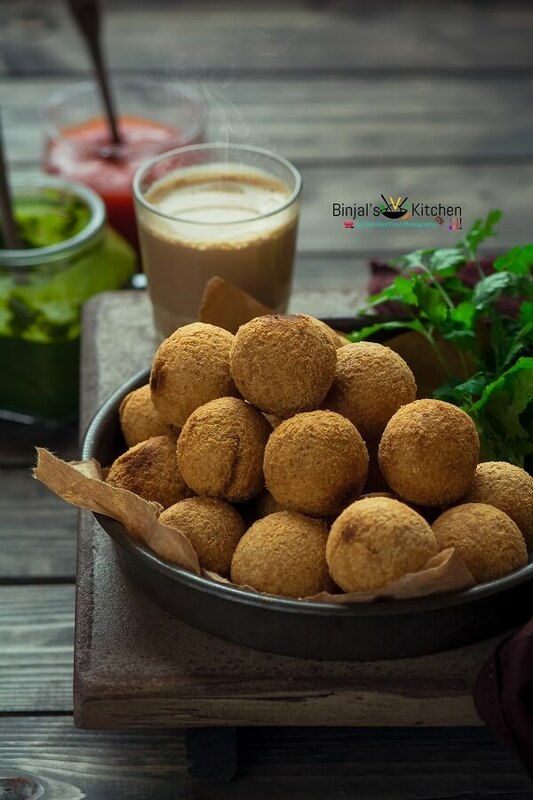 Line the parchment paper on baking sheet, arrange the prepared kachoris over it, brush it with oil or ghee and place the baking sheet into the preheated oven. 13. Bake it 18-20 mins till golden brown. 14. Check while baking and turn upside down one time to bake all sides. 15. Lilva Kachori is ready. Serve it with chutney, tea as a snack and enjoy. • Do not knead the dough too much. • You can freeze the half-baked kachoris into the freezer in an air tight container or a zip lock bag for later use. Just thaw and bake it again 10-12 mins before serving or eating. • Add sugar and spices as per taste. Here are those post of virtual Diwali potluck party! Check out and enjoy! Happy Diwali to Everyone! Lilva Kachori is a perfect snack for a party. Lilva Kachori is healthy, protein booster, nutritious and tasty at the same time. I made backed Lilva Kachori rather than deep fried, which is healthier than deep fried. Lilva Kachori is perfect for celebrations or any occasions like Diwali, Holi or Eid festival. The one black spot that usually mars the goodness of kachoris is that they are deep-fried. Here is a non-fried version of Lilva Kachori that you’re sure to enjoy as much as the original. 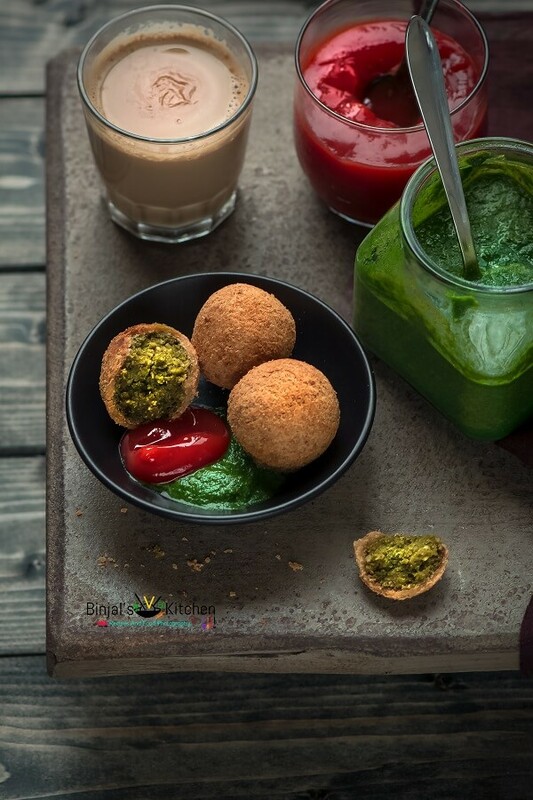 You can now indulge in the protein boost of Lilva and green peas without worrying about the calories of a deep-fried snack! In a mixing bowl, add flour, suji, besan, salt and melted ghee. Rub the mixture with hand palms and mix it well. Add water little by little, knead it and make a stiff but smooth dough, do not knead the dough too much. Make the small lemon size balls from the dough and cover it with damp cloth and keep aside. In a food processor jar, add pigeon peas, green peas, coconut, ginger, green chilies, coriander leaves, salt, sugar and lemon juice. Blend it and make a coarse mixture. Heat the oil in a kadhai. Add cumin seeds, hing, the prepared coarse mixture, red chili powder, turmeric, coriander powder and stir fry it for 1-2 mins. Remove it from the flame and keep aside to cool down. Preheat an oven on 350F/180C. Take the prepared dough ball and roll it into small circle. Use a drop of oil if its sticking while rolling. Put the spoon full of the prepared stuffing on center of the circle. Seal the edges on top, remove the excess dough, give a round shape by rolling between the palm and make a perfect round ball to make a round kachori. Repeat the same method and make more round kachoris. 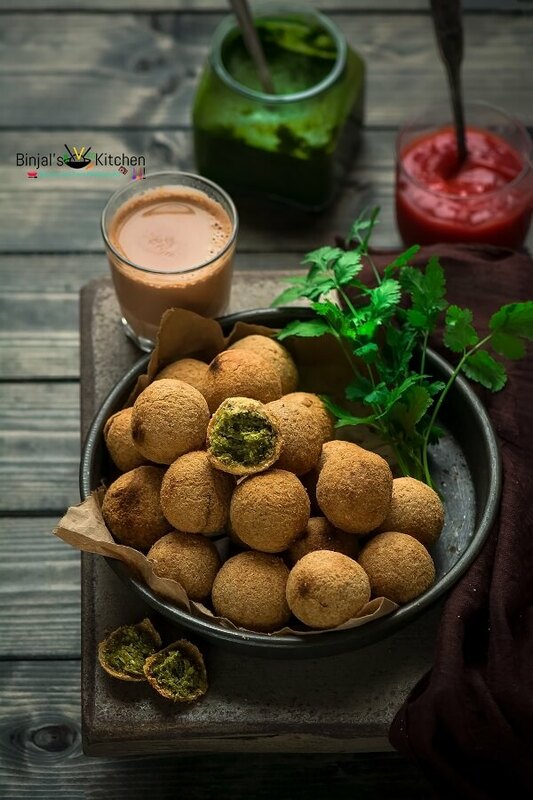 Line the parchment paper on baking sheet, arrange the prepared kachoris over it, brush it with oil or ghee and place the baking sheet into the preheated oven. Bake it 18-20 mins till golden brown. Check while baking and turn upside down one time to bake all sides. Lilva Kachori is ready. 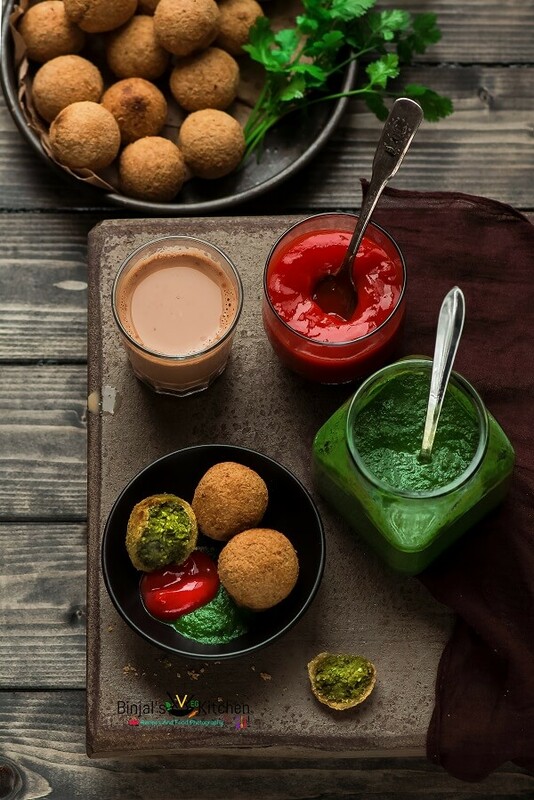 Serve it with chutney, tea as a snack and enjoy. I love the fact that you baked it instead of deep frying. I never heard of lilva kachori before and definitely going to give this a try! Thanks Binjal for being a part of this virtual potluck!